With more breweries opening in the area, and more customers bellying up, growlers in hand or looking to sample flights of beer, craft beers are clearly having a moment. And this fall, in Greensburg, they will again get their own week — plus an extra two days. Following up on the success of last year’s inaugural event, the second annual Greensburg Craft Beer Week is set for September 21 to 29, according to a news release. The nine-day celebration of craft beer and the Greensburg community features multiple events throughout the area. Organizers added three days to this year’s festival, hoping to expand on the 37 events held last year and increase participation from businesses, bars and restaurants who missed out last year and who are looking to host. “This year we are thrilled to partner with additional local businesses and offer a longer event time frame,” says Jenn Weir, a craft beer week founder and organizer, in the release. Among the new plans is a Collaboration Beer Tasting and Home Brew Competition set for Sept. 23. Information for those who enjoy home brewing, a popular regional hobby that has led to some of the new breweries opening, will be released in coming months, the release notes. Also new is a Sept. 20 Unofficial Kickoff Party at Yellow Bridge Brewing in Delmont. 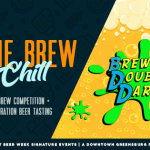 Jessica Hickey, Downtown Greensburg Project founder, and Weir, who works for Greensburg Beverage, came up with the idea of a craft beer week for the city. During the first week, participants could choose from beer dinners, nonprofit fundraisers, beer pairings with desserts and various beer tastings. This year’s goal includes dreaming up new events for craft beer aficionados. Look for event updates starting Aug. 21. Details: greensburgcraftbeerweek.com or email greensburgcbw@gmail.com for sponsorship information.